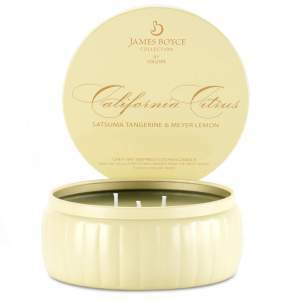 Voluspa James Boyce Candle Tin-California Citrus. 11 Oz, 85 Hr. burn time Burn Time. Satsuma Tangerine and Meyer Lemon made with Apricot Seed Oil Wax formula. 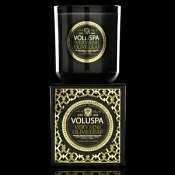 Voluspa in collaboration with renowned Chef James Boyce designed these specialty candles that complement culinary scents but are worthy of any room in your home.. 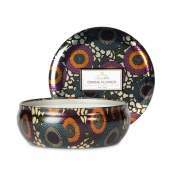 These Chef-Hat inspired Candle tins are polished to a colorful satin sheen. 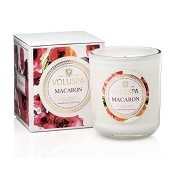 Delightful to look at as they are to smell with embossed antique script in bronze that is elegant and reminiscent of vintage French wine labels. The generous 11 Oz size, paired with the three wicks create a wonderful fragrant ambiance throughout your kitchen and home. Chef James Boyce was nominated for a James Beard award and is known for masterfully infusing California influences into classic French cuisine.